Beauty is power; a smile is it's sword! Valerie has been complaining about her teeth for quite some time. I don't know if anyone was teasing her at school or if it was just her own thoughts. She hated her 'Sponge Bob teeth." Of course, she is always beautiful to me, no matter what. Sometimes I tried to see her how others did, and I understood why the teeth bothered her. I hated my smile and my toothy gaps, too. No one wants to go around with their two front teeth sticking out all the time. In a few dance costume pictures I took, I could see just how far those front teeth jetted out. Her make-up was a disaster because the red lipstick just ended up all over her teeth time and again. Earlier this week I took Valerie to the orthodontist for a consultation. 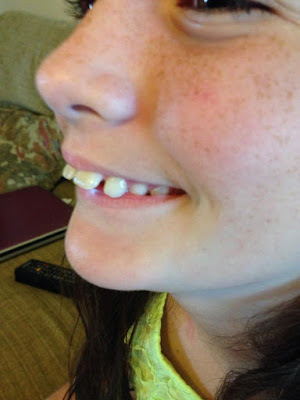 I wasn't sure if she was even a candidate for braces yet being that she is only ten. She still has a few baby teeth to lose also. Reading online I learned that it is a case by case decision, as sometimes younger is better. The verdict was YES, braces now will help her. She has been lucky in that nothing has hit her in the mouth and broken those protruding teeth. Val said she was ready, so we did it. She walked out of the consultation with a new smile. 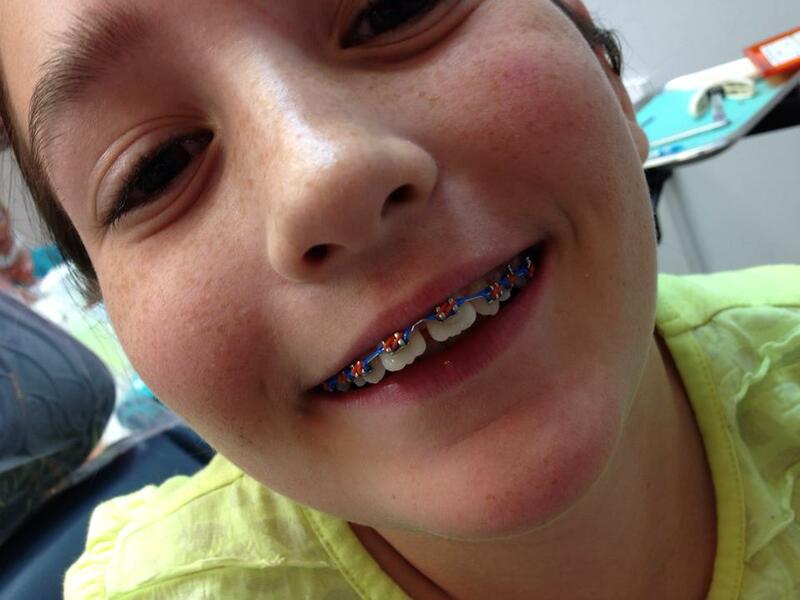 She chose blue and orange bands because those are the colors of her new school! Bottom braces to come at a later date. The first day was rough. She complained all day about her teeth hurting. They put a power chain across them to tuck those front teeth back first before anything really bad happens. I know it isn't quite what she expected. I was worried that maybe it was too soon. Maybe she wasn't ready. Every day has been a little bit better. The wires were poking out the back braces and scratching the inside of her cheek, so we had that fixed today. Val said it was much better, but her teeth are still very sore. I know it's an adjustment and she has to get used to them. And she will get used to them in time. I had braces for two years and don't remember much, other than it took a week or so to forget I had them. It was well worth it in the long run, so I hope it is worth it for my Val Gal too!! Even after all these months, I still find myself thinking about my Pepper cat. He was such a funny cat, and there will never be another like him. I still feel sad that I rescued this tiny beautiful kitten and as his life was beginning, it was suddenly over. The whole situation with finding out he was sick and having him put to sleep broke my heart into a million pieces. Off and on I looked at kittens. Off and on I'd want another. I looked at Ragdoll kittens for sale online. As beautiful as they were, there was no way I would spend $1000 on a cat with so many with no home. I still missed my Pepper cat. Last week I spied a Pepper look-a-like on the Terrebonne Parish Animal Shelter's Facebook page. With out any hesitation, I went online and filled out an application for him. I know he isn't going to be the same cat, but I missed having a kitten in the house. Anyway, after a bit of red tape, he came home with us! He was so shy and reserved at first, then he got sick. Very sick. Poor kitty couldn't breathe and was gasping for air. I took him to my vet and got medicine, and thankfully he is on the mend. I know it's common for shelter cats to be sick and I am just glad it wasn't anything serious this time. He's bouncing off the walls now doing all the funny kitten things that kittens do. The kids want to name him Bing Bong. Uh no!! After some debate.... we decided on Gizmo! But I still call him Bing Bong for fun some times. Here he is... introducing our little Gizmo!! A little late.... but I just got around to uploading the videos from our dress rehearsal!